The landscape approaching Russia’s spaceport in Baikonur is otherworldly. The yellow steppe of southern Kazakhstan where it is located is effectively desert, unbroken flatlands for hundreds of miles covered by a layer of scrub. 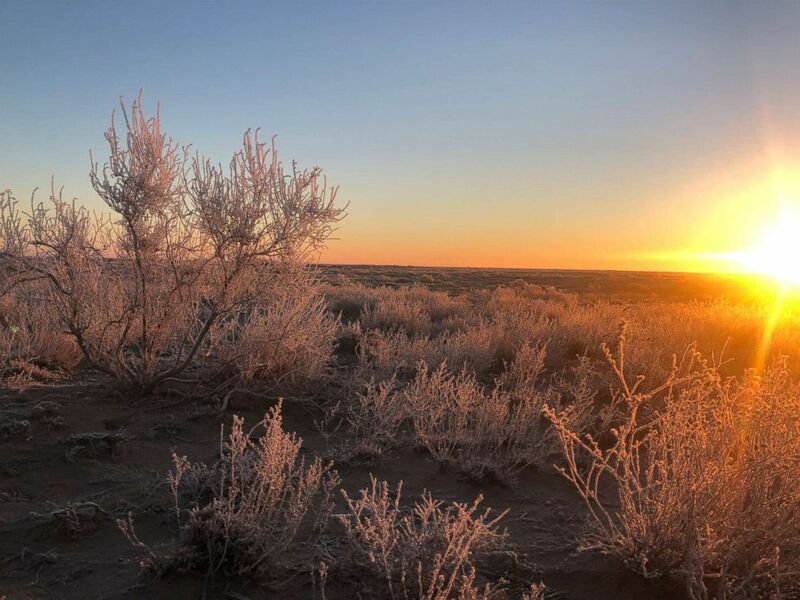 In December, the freezing winds that blow across it encase the scrub plants in ice, making them look like silver coral sprouting out of the sand. Established at the dawn of the Cold War space race in the 1950s, Baikonur is Russia’s chief spaceport and, for now, the only launchpad in the world sending manned flights into space. Since NASA retired the space shuttle in 2011, Russia’s Soyuz rockets -- launched from Baikonur -- are the only option for astronauts headed to the International Space Station. The monument to the Soyuz carrier rocket in the city of Baikonur, Kazakhstan, Nov. 12, 2016. The latest Soyuz flight to the ISS took off from Baikonur this week with an American, Canadian and Russian on board. It was the first manned Soyuz mission since a mid-air accident during a launch in October temporarily grounded them. That accident had been the first failed flight with a crew aboard a Soyuz since 1983, and it briefly turned global attention to Russia’s space program and the flights from Baikonur, which normally pass as routine. Beyond this week's launch though, the aging Soviet-era spaceport tells the broader story of Russia’s space program and its troubled existence decades after its Cold War heyday. When Soviet military engineers first arrived in 1957, they started building in empty desert. 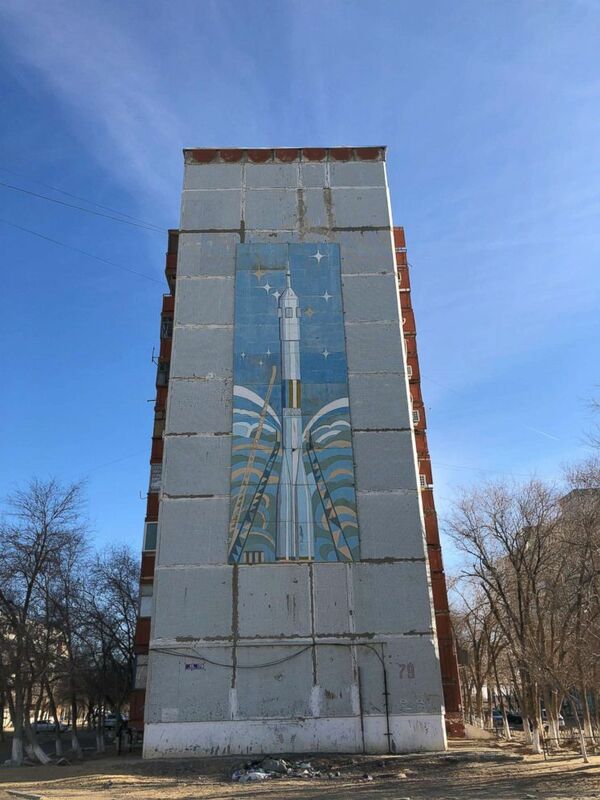 The construction teams, transferred to Kazakhstan after helping rebuild infrastructure in war-shattered Eastern Europe, slept in tents as they labored secretly to erect a rocket pad for the world’s first intercontinental ballistic missile, the R-7. In the 1960s, a planned city was built up to service the launch pads, eventually completed in typical Soviet style around a central square with a Vladimir Lenin statue. High rises, cinemas and cultural centers with names like "Saturn" and "Venus" were also laid out. 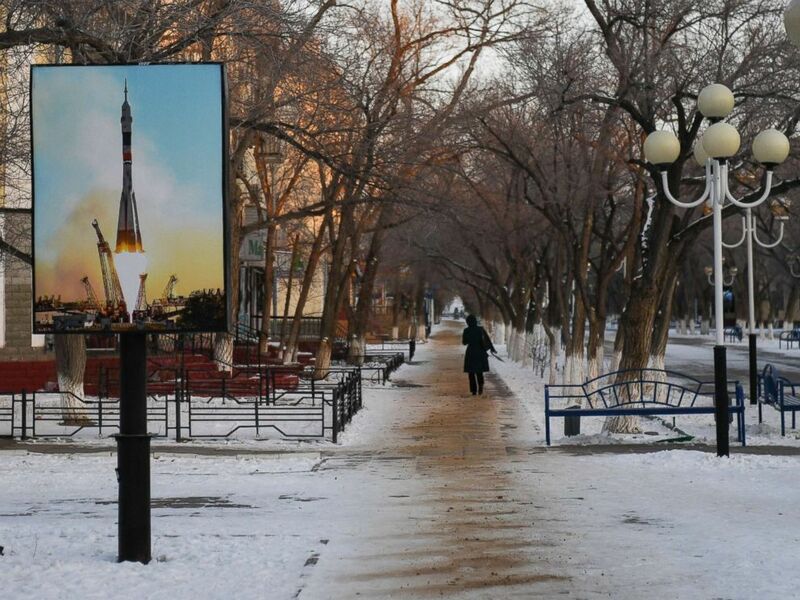 A poster of a rocket is seen in Korolyov Prospekt in Baikonur, Kazakhstan, Dec. 14, 2017. The Soviet Union’s greatest space feats would be launched from Baikonur, including Sputnik, the world’s first satellite that kicked off the space race, and Yuri Gagarin, the first man to leave Earth. But the spaceport's fate was closely tied to the USSR and as the Soviet Union's economy rotted in its later years, Baikonur struggled and it was already falling into disrepair when communism collapsed in 1991. Baikonur suddenly found itself marooned in the newly independent Kazakhstan. Russia and Kazakhstan’s new governments agreed that Moscow would rent Baikonur and in 2005, the lease was extended until 2050. The city is a closed territory and outsiders, including Kazakhs, need permission to enter. Russian law applies and the checkpoints at the roads into the city are guarded by Russian police. Inside, the city of around 40,000 people seems partially frozen in the 1980s. Constructions sites for new apartment buildings on the Kazakhstan side in some places run right up to city limits, while on the spaceport side, most buildings have been barely renovated in decades. The chimneys of a heating station in the city center trail dirty, black smoke and the tower blocks painted with murals of rockets are cracked and some patched with wood. Russia's spaceport in Baikonur, Kazakhstan, Dec. 2018. "What feels most strange is that this town is still like the Soviet times," said Eduard Velikanov, a guide at the city’s state history museum. Almost everyone in Baikonur works for the spaceport or provides services for those who do. Locals sometimes watch the rockets taking off from the launch pads about a dozen miles away, some climbing onto roofs for a better view. Some residents believe the rockets alter the weather, saying winds blow from all directions for days after a launch. Kids at a local school recalled a 2013 crash of an unmanned rocket, saying the heat from the fire could be felt in the city and remembering a kerosene-like smell in the air. 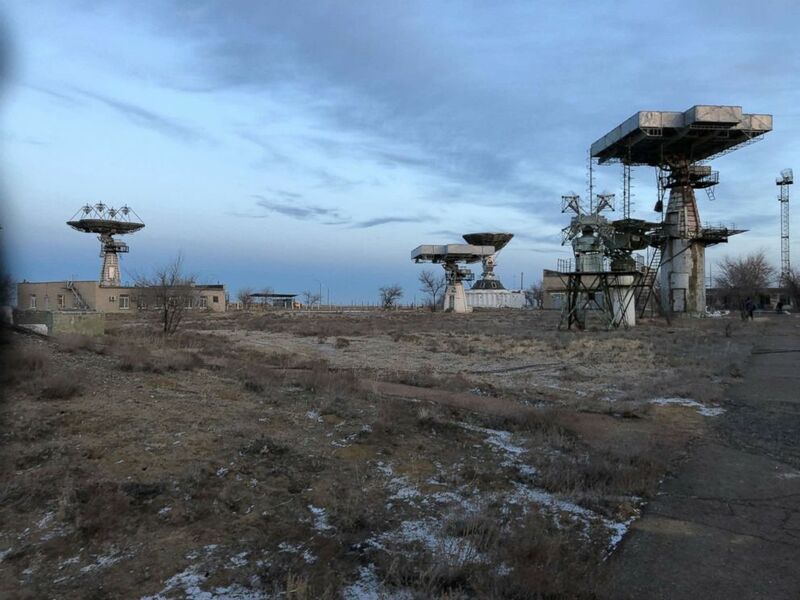 The launch areas themselves are also strewn with relics and detritus of the Soviet space age. The launch pads have been modernized, but many of the buildings around them are crumbling. At an observation point after a launch this week, punctured and rusted satellite dishes were set up as an outdoor museum with placards. It was difficult to discern which satellite dishes were exhibits and which ones were functioning until one of the hulking, rust-stained radar arrays suddenly began turning. It was tracking a Soyuz rocket, a guide explained. 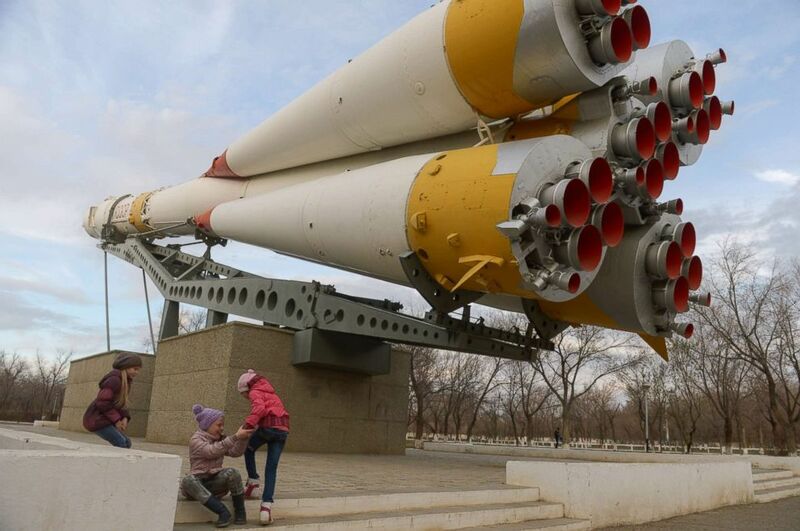 Baikonur's crumbling condition mirrors deeper problems in Russia’s space industry, which has become plagued with allegations of colossal corruption and theft. In June, Alexei Kudrin, the head of Russia’s Audit Chamber, told Parliament that the chamber had found 760 billion roubles (about $11.4 billion) in violations in the accounting of Russia’s space agency, Roscosmos, for 2017. "Several billion have been spent, basically stolen," Kudrin said on the state channel Russia 24. A building in Baikonur, Kazakhstan, Dec. 2018. "Roscosmos is the champion in terms of the scale of such violations," he added. In November, Russia’s Prosecutor General’s office said it had opened 16 criminal investigations into Roscosmos, whose quality control director was stabbed to death in a Moscow jail in 2017 as he awaited trial in another graft case. The endemic corruption, low wages and loss of prestige has led to a brain drain at Russia’s space program, which in turn is struggling to maintain quality and develop new rockets. At Baikonur’s International Space School, a high school that encourages children to find work in the space industry, a large poster in the corridor carried warnings about corruption, listing its different types and effects. Under Russian President Vladimir Putin, Russia has sought to revive some of its Soviet-era space glory. An ambitious new spaceport in Russia’s far east, called Vostochny, is under construction and is intended to partly replace Baikonur. Vostochny has launched some unmanned rockets but has experienced serious delays amid repeated corruption and labor scandals. It is now behind schedule to take over launches from Baikonur. These stumbling efforts have been overseen by Dmitry Rogozin, who heads Roscosmos. Rogozin is a sanctioned former deputy prime minister and nationalist politician who is a long-time Putin ally. Known for his pugilistic style and occasional anti-American outbursts, Rogozin has argued that bold long-term proposals are needed to pull Roscosmos out of its malaise. Chief among those proposals is for Russia to establish a permanent base on the moon, which Rogozin in November pledged will happen, adding that the Russian cosmonauts would “check” whether America really had landed there in 1969. Last month, Roscosmos officials suggested that Russian astronauts would land on the moon by 2030 and that parts of the base could be brought there in the late 2020s. In reality though, Russia’s rocket industry is struggling to keep up with the vehicles being developed by private companies, such as SpaceX and Boeing. Corruption has eaten into its manufacturing and assembling processes, with a string of rocket failures linked to problems with parts. Following a 2016 crash of a Proton rocket, Roscosmos had to send back 70 engines for review over concern about faulty components. October’s accident was found to have been caused by a broken sensor damaged during assembly at Baikonur. "Russia is certainly falling behind as a leading space power," said John Logsdon, a veteran expert on space policy at George Washington University’s Elliott School of International Affairs. "Russia has been promising new systems for human spaceflight for years and have yet to deliver on those promises." 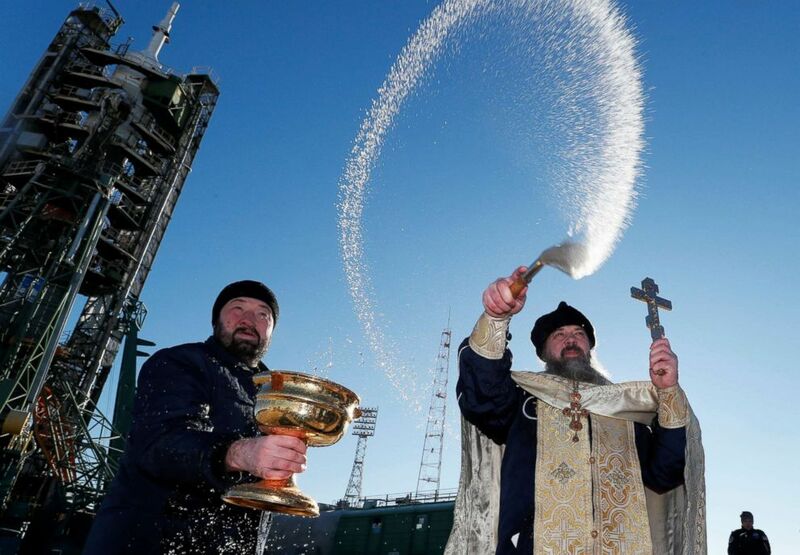 An Orthodox priest conducts a blessing in front of the Soyuz MS-11 spacecraft set on the launchpad ahead of its upcoming launch, at the Baikonur Cosmodrome in Kazakhstan, Dec. 2, 2018. NASA’s reliance on Russia in space has caused some disquiet in the U.S., where critics have expressed fears it leaves the agency vulnerable to deteriorating U.S.-Russia relations. The relationship has also been vulnerable to outbursts from Rogozin, who was sanctioned over his role in Russia's 2014 seizure of Crimea. This fall, Rogozin suggested, without evidence, that a hole found in a Russian module of the ISS could have been deliberately drilled by one of the astronauts aboard, a claim that NASA quickly knocked down. A preliminary Roscosmos investigation found it had likely in fact been drilled on Earth during assembly, but the comment from Rogozin -- who has previously suggested Russia could unilaterally undock its modules from the ISS -- bemused NASA. Shannon Walker, a NASA astronaut attending this week’s launch, said she had been surprised by the comments, but suggested NASA saw them as separate from the two space agencies' day-to-day cooperation. "Obviously, we discounted it immediately because that makes no sense to us," Walker told ABC News, noting Rogozin's political background. "He was deputy prime minister and so his view of Russian-American relations has perhaps come from that background," she said. NASA praises the relationship in space as one of the few examples of cooperation left between U.S. and Russia. The U.S. agency currently pays around $80 million a seat on the Soyuz flights, distributing them to Canada, Japan and European countries that financially support the station. But Baikonur’s monopoly on flights to the ISS is ending. From next year, NASA hopes to begin restarting its own manned launches from the U.S., using commercial rockets produced by SpaceX and Boeing. Both companies are due to hold test flights with empty spacecraft to the ISS by mid-2019 and to make crewed test flights before the end of the year. Logsdon believes that the Soyuz will cease to be America's primary way to the space station within 12 to 18 months. That shift will cut off a helpful revenue flow for Roscosmos. It means the number of manned flights from Baikonur will fall, likely from four per year to two. But NASA has said it will ensure American astronauts continue to fly from Baikonur for as long as the ISS is active, which means until at least 2024 and perhaps beyond. Satellite launches, which make up the bulk of the flights from Baikonur, will continue. And with Russia’s alternate spaceport Vostochny struggling, residents in the town said they felt Baikonur's position is fairly secure for now. Velikanov, the museum guide, said he felt Baikonur symbolized Russia in some ways. "It is the way Russia lives nowadays: something very old and some new technologies," he said. "It is the clash of epochs."